A reliable guitar with a good sound. Clarity at the top end not quite there. Camps has been making guitars since 1945. This flamenco guitar sports a solid spruce top, which contrasts well with the black tuning pegs, binding and dark rosewood bridge. The back and sides are made from a striped honey-coloured sandalwood, the neck from a similar coloured cedar, which is capped with an ebony fingerboard. A fine rosette incorporates the signature ‘c’ as a repeating pattern. The construction is slick and the gloss finish gives it centre stage status. A definite advantage for Camps M-5-S is the adjustable steel rod, which has been incorporated into the cedar neck giving you a chance to customise the fingerboard straightness - perfect for students and professionals alike. The added strength in the neck certainly gives the left hand something to sink into. This level of technology can be found in all camps’ guitars - something camps is extremely proud of, while not forgetting its more traditional guitar-making roots. Overall it has great playability with plenty of versatility in tone with a particularly punchy treble. To us, the fingerboard on the Camps M-5-S doesn’t feel as fast as the recently-reviewed Alhambra (possibly due to a slimmer feel in the neck), but our right hand has more space for fingerstyle playing. There’s plenty of volume and the notes ring with a clear zing. It has a definite warmer tone compared to the Alhambra, but this guitar is one which will probably do better in the hands of a more seasoned player looking to expand their repertoire. All of Camps models are constructed entirely in its workshops in Girona, Spain but distributed around the globe, so you shouldn’t have too much trouble getting hold of one. It can customise the instruments for you too - so if you need a cutaway or electrics then the company will happily oblige. 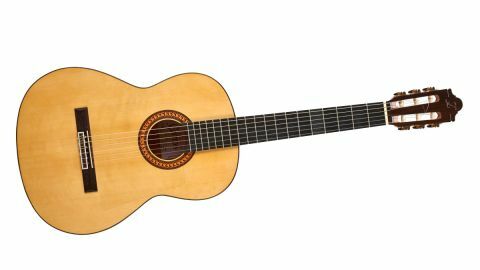 For the technology at play, combined with traditional craft, Camps has produced a fine flamenco guitar at a good price.